Get over nerves, stage fright and general performance anxiety with this self-hypnosis mp3 by Steve G. Jones! A healthy level of anticipation, excitement and nerves before any performance is actually a positive thing – because this means that you are taking your performance seriously and care about the outcome. However, if this level increases to the point where there are feelings of discomfort, fear, distress and even subsequent negative behavior changes, you can end up losing your confidence and focus, which is the dread of any musician. 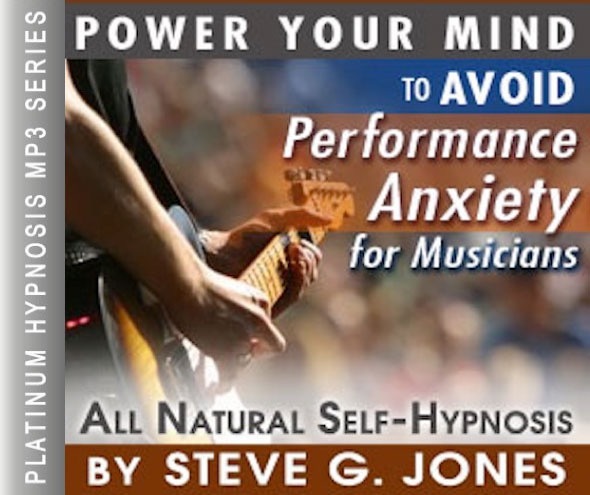 Use this Performance Anxiety for Musicians Hypnosis MP3 – designed especially for Musicians who suffer from stage fright and general anxiety related to performing – and you will find that your desires to perform will no longer be tainted by fear and plagued with self-doubt. Steve G. Jones, Ed.D., Clinical Hypnotherapist, charges $1,500 for a custom recording and $25,000 for a one-hour private hypnotherapy session at his office. But you can get all the benefits for this low price. Simply listen to the Performance Anxiety for Musicians Hypnosis MP3 session every night as you go to bed for three weeks and feel the changes happening in your life. You will feel more empowered, more in touch with your true self, and you will truly know that your goals are within your reach. Steve G. Jones achieves AMAZING and LASTING results!!! Hypnosis is the easiest way to affect change in your life because the positive messages go straight to your subconscious mind effortlessly so you can accomplish your goals and reach for the stars!! All you have to do is listen to the Performance Anxiety for Musicians Hypnosis MP3 download at night as you go to sleep!!! You’ll hear soft music, the gentle sounds of the beach, and the soothing sound of Steve G. Jones’ voice all working together to bring about positive changes in your life easily and naturally. Steve G. Jones has been helping people improve their lives with hypnosis for over 17 years…now it’s time for the Performance Anxiety for Musicians Hypnosis MP3 to help YOU… don’t wait, do it NOW !!! you’ll be glad you did. See you at the top! As you continue relaxing deeper and deeper and more deeply relaxed, I would like you now to imagine yourself performing in front of an audience and as you do, just notice how relaxed you are, that’s right. And as you perform you are so very in touch with yourself musically. It seems as though the music flows through you. Whether you are singing or playing an instrument or both, everything just flows through you. It’s as if there is a loop, a loop of energy. You receive energy from the audience and you give back that energy and the more energy you give, the more you receive and the more you receive, the more in touch with your musical ability. You are so relaxed and you smile. You continue playing and the more you play the more you perform, and the more you perform the more you relax, deeper and deeper. And so whether you are singing or playing an instrument or both you now picture yourself performing and relaxing. And you realize now just how you love performing in front of others, how in tune you are with your music and you find room for creative expression because you feel free to express yourself musically. Day by day you are becoming more and more relaxed with the idea of performing in front of larger and larger audiences because you relax. You prepare ahead of time by taking a deep breath, holding it, centering yourself and exhaling slowly. You do this several times before you perform. And each time you inhale, you breathe in confidence and creativity and relaxation. And each time you exhale you let go of any anxiety. You let go of any fear. You let go of any doubt, you let it go and you relax and you are prepared. And after your performance, you relax and you congratulate yourself on a job well done because no matter what happens when you are performing, that is what is supposed to happen because each time you perform you do your best. So when you are finished performing you congratulate yourself on a job well done no matter what happens during the performance. You relax now deeper and deeper, relax. I’m going to now give you a post hypnotic suggestion, something you can use each time you perform. From now on, before you perform, while you are taking deep breaths in and out, breathing in confidence and letting go of doubt, breathing in motivation and letting go of fear, breathing in creative energy and letting go of anxiety, while you are doing all of that all you have to do is touch the tip of your right index finger to the tip of your right thumb and make an okay sign by touching the tip of your right index finger to the tip of your right thumb making the okay sign you send a signal to your subconscious min that everything is going to be okay. You do this once briefly while you are preparing to go on stage and if during your performance at any time you feel a sense of doubt, you repeat this action making the okay symbol with your right hand and this immediately puts you back in the frame of mind where you are confident because every time you make the okay symbol with your right hand you are immediately confident and you can recharge this confidence during your performance if you need to. And this is called a post hypnotic suggestion because you can use it outside of hypnosis after the hypnosis is over. You can use it any time you need a little extra boost of confidence because it will immediately put you in a very confident state. So relax now and realize you have everything you need to be relaxed on stage while you are performing because you are a brilliant, wonderful, amazing performer and you let music flow through you. Receiving energy from the audience and giving it back, receiving energy and love and appreciation and giving back your best performance. And you realize that this loop begins with you. You give to the audience first and then you receive that and then you give even more and then you receive back even more and you are so relaxed, so relaxed, so relaxed at all times. Whether performing or not, you are relaxed at all times because you are a very, very confident person.